It's time for another wonderful color challenge at the CR84FN Blog! Thanks so much to those who played along with our last challenge! 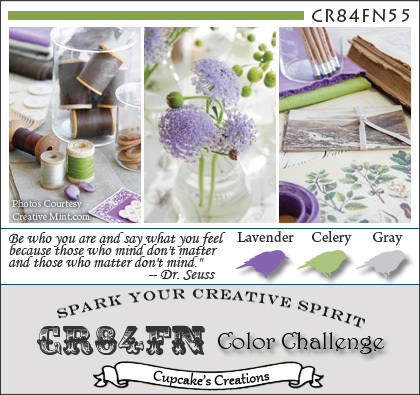 Our next Two Week Color Challenge is to use the colors Celery, Lavender and a Grey. My recent go to paper pack (We R Memory Keepers) has some wonderful papers that are just perfect for this weeks challenge, design inspiration is from this weeks Mojo Monday Sketch. The Verse (Verses Rubber Stamps IN0226-E) is stamped in Grey on a Vanilla panel. The Flower was created using the two smallest stamps and dies from Heartfelt Creations Tattered Blossoms Set. I scrunched and pinched the edges of the petals, then layered them on top of each other to form the blossom. I added the blossom to a Memory Box Die (Macarena Corner), and embellished with a Stick Pink that my friend Sue made for me! The added stitching is done using a stitch stamp from Unity. Here's this weeks color inspiration, we'd love for you to play along with us at CR84FN, you can find all the details here on how to enter. If you upload to any online gallery please use keyword CR84FN55 so we can find your creations! Such a pretty card Lisa! Love the Tattered Blossom and the little butterflies fluttering about! The beaded stickpin adds a nice touch! This is gorgeous Lisa, I love the little pin and sweet butterflies, and the wonderful verse. Beautiful card. This is just lovely. I really like the ragged rose, tiny butterflies and fabulous pin!! Lovely verse too! Love the flower!!! And the stitching stamp! Great accent ! Lisa, LOVE that verse and your scrunched flower is FABULOUS! LOVE the butterflies as well! Beautiful! Love the flowery details and the sentiment is lovely. Fabulous layout, I love the purple flowers and butterflies-beautiful. Love your sentiment and those fab faux stitching stamps. A non sewing girls best friend. ;)The stickpin really adds a touch of elegance and I love your card Lisa! SO SO PRETTY Lisa! Love the papery bloom and that gorgeous stick pin!